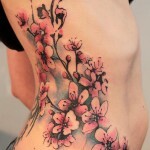 Much like many popular tattoo styles, the cherry blossom tattoo has a rich history. 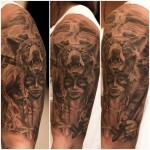 Its appeal has spanned centuries and impacted tattoo culture with its varied meanings and interpretations. 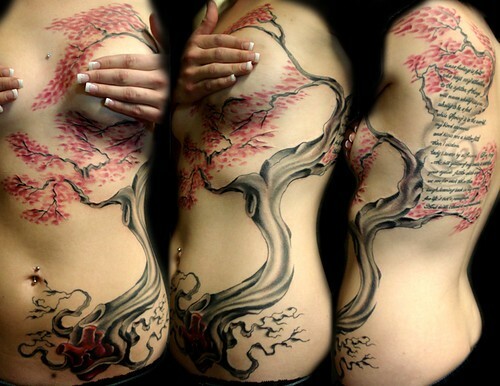 While you might choose a cherry blossom tattoo based solely on its aesthetic value, it might interest you to learn some of its more common meanings. You may find it to be more defining than you think. 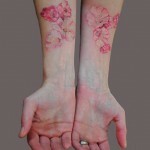 The cherry blossom tattoo originates with the Japanese art of wood-blocking and evolved into a significant genre of body art evoking various images and emotions. Wearers of these tattoos often choose them to signify different things about themselves. The life-cycle of the cherry blossom itself is an iconic part of Japanese culture as the blossoms (known as “sakura”) bloom sometimes overnight and fall to the ground very shortly thereafter. The sight of them is so breathtaking that many Japanese organize parties and groups for the express purpose of viewing them before the flowers fall. These traditions span centuries, perhaps even longer and speak to the reverence afforded these fragile flowers by those lucky enough to see them in bloom every spring. 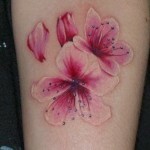 Cherry blossom tattoos are simple and elegant. They are not overstated. 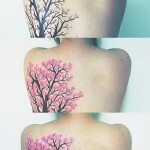 People whose personalities fit these traits often choose this kind of tattoo as a reflection of their own personalities: the fragility of the flowers coupled with the much stronger tree to which they cling, even for just a short while. 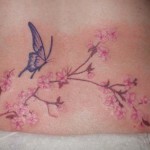 Cherry blossoms are also considered a lucky symbol in Japanese culture. 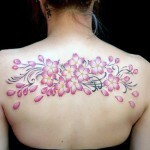 For this reason, a cherry blossom tattoo is often coupled with other imageries associated with luck. 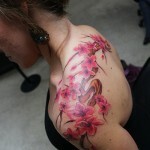 It is not uncommon to see cherry blossoms coupled with koi fish in tattoo designs, for example. The wearer of this tattoo may chooses it as a symbol of success in business or other areas of life, like family and various personal endeavors. One of the most interesting meanings of the cherry blossom is its association with the Samurai. The significance there is the Samurai’s acceptance of death at any moment and the forsaking of looking too far into the future. 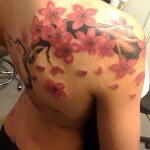 A cherry blossom tattoo can then signify an understanding of the momentary nature of life and spiritual readiness to face the unknown. 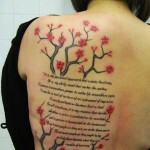 Whatever meaning you give it, your cherry blossom tattoo is an extension of yourself. It can mean whatever you want it to and its significance might even change as time goes by.